Category Archives for "Yoga Teachings"
Namaste, Pranams Divine Beings, this is Nandhiji. It is beautiful to connect to the grace of this Guru Poornima moment! The grace of the Guru’s powerful blessings, these are moments of huge shift, individually, collectively for humanity and for Planet Earth. This Guru Poornima is particularly more enhanced due to the Eclipse. This means that there is potential for each one of us to expand into our truest selves and that is Source. My story goes back to the time when I was a seeker, and in those days, Guru Ayya was on his 8th year fasting and in his fasting drinking one cup of milk a day, he had not slept, he had gone beyond sleep. 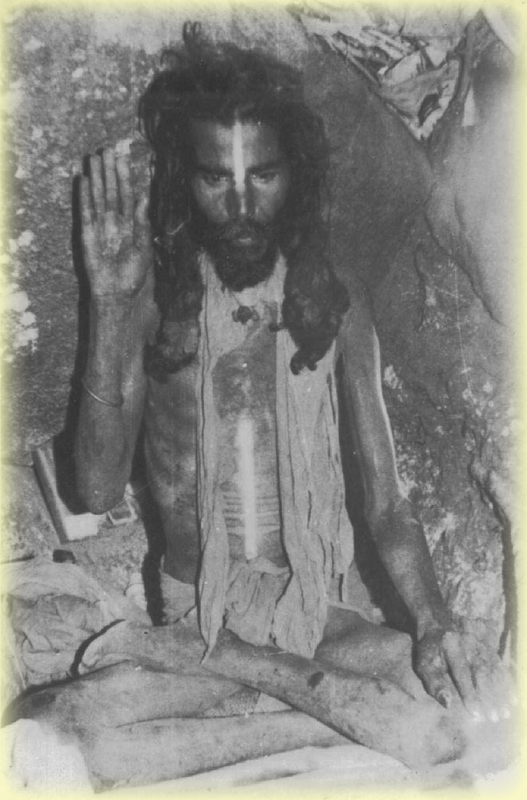 He was in a cave up in the Arunachala Mountains. I so wanted to know and experience, whatever he was experiencing. I decided to stay overnight behind him (behind the partition of his cave) to observe and to meditate and to be with him. I was behind him through the night meditating. Around 3 o’clock he was in ecstasy singing. It felt like there was a pillar of Light and all Angels were dancing around it and He was that pillar of Light. There was so much joy, happiness, vibrancy of the dance at that moment that I felt, that vibrancy, that light would perpetually be with me. Every time I invoked Guru Ayya by way of his mantras, it would be a heart song that connected me back to Guru Ayya’s ecstasy. A few years later, I moved to Los Angeles. Guru Ayya would come to me in my meditation and say: “When you sing for us, it’s beautiful. Now it’s time for you to sing for humanity.” At first I was hesitant. I was very shy. I could never imagine myself singing before anyone, and so I had a bit of resistance towards it. I set a condition to myself & Ayya that I would need a didgeridoo player to go along with my chants should I create my Siddha mantra chant music. My very next yoga class I taught had a didgeridoo master, Cofi, come to learn my yoga. Cofi introduced me to music composer Wing. The Siddha intent of dream to reality was happening fast! Just a week later was the Guru Poornima moment, when it happened, bringing us all together with Cofi, the didgeridoo player, Wing, the composer, the studio and in a swift moment our first musical album “Cave of the Siddhars” was born. The Siddha offerings of consciousness by way of mantra chant music was born with ease at the Guru Poornima moment. It was the energy fields of Guru Ayya and all my gurus coming together to give to humanity the resonance, the resonance of Light, the resonance of transformation, the resonance to wake up our inner Guru. Today I will be giving 10 dimensions for us to attain the Super Mind. What is the Super Mind? This Super Mind of the yogic mind is the mind state of Turiya. Thought is reality. The potency of thought is the grandness of reality and a potent mind, a powerful mind creates empowered thoughts and so is our reality. In other words, when we have the Super Mind, everything is possible, anything is possible. We are beyond the limits, the normal limits of the mind. This Guru Poornima moment allows us to absorb these 10 dimensions that we will go through today- as our inner journey, as our wisdom of joy, for which discipline can be set to attain it. The first is to know that the Guru is Consciousness. Guru means dissolving away the karmic limits. The Guru is dissolving away ignorance. When ignorance is dissolved away what remains is pure, pristine empowerment of the source connected mind. Ramakrishna Paramahamsa, a great master, would mention the mind is a mirror. When there is any dirt on that mirror, we are not able to see clearly. When the dirt, that ignorance is removed, we are able to connect to Source with totality of clarity. Who are the Gurus? There are five Gurus, the five dimensions of Gurus. The first is our own breath. The second is our mother and father. So, rub our palms together, feel our mother, feel our father and receive the blessings. The third Guru is the external Guru, who gives us the mantra to wake up. Fourth Guru is the inner Guru. Now with the inner Guru awake, we realize everything is a Guru. We are a part of everything and everything is to teach us and to guide us. That’s the fifth Guru. So, understanding Guru as Consciousness and understanding the connectivity to the Guru, we know gratitude. So, for a moment, be in the mind of gratitude. Gratitude especially to all the external Gurus who woke us up. [My gratefulness to each of my seven Gurus on this special day! My first Guru, Bhairavasekar Swamy, who took me through my death experience. My second Guru, Saddhu Krishnaveni Amma, who dwelled in a cave, who left her body. Siddha Rajaswamy, Rohini Mataji, our Gurus who bridge the ancient Siddha wisdom & Siddha lineage grace. Amma Amritandamayi, the hugging saint Amma whose hug conveys Her presence within each. Siddhapurush Baba Nataraj, Los Angeles who is a Siva Yogi constantly uplifting humanity in his prayers. Siddhar Mahasivaswamy, the Sage who lived in solitude for over two decades meditating inside a tiger sanctuary. Time: The next is understanding that we experience life through time. In other words, all our realities are experienced through time. When we are sleeping, we are not experiencing time. When we wake up, when we are awake, when the mind is functioning in an optimal level, it is in the dimensions of time. Now in the dimension of time is where the mind is. If we step out into timelessness, which is meditation, if we step into timelessness, when we come back to time, that time is empowered. So, meditation is beautiful in all its forms. When we do yoga, in reality, there is a meditative process happening. When we are drawing or when we are dancing, there is a state of meditation going on. When driving in states of joy, there is a meditation going on. That is timelessness! Glimpses of timelessness… If we attain the totality of this timelessness, then when we experience life as time, we define time. In other words, we are able to bring that timelessness of our beingness into reality in the form of harmony, core states of joy and all the bliss around it. Because the qualities of timelessness is brought into time, prioritize the need to be in the timelessness, because, when we are in timelessness in experiencing time, it is like operating from a meditative mind and a meditative mind means a mind of pristine clarity, where every thought is pure, sheer wisdom, every thought has an accuracy from seeing the larger picture. Breath: Now, the next is to know breath and the womb of breath, Samadhi states- with the mind completely absorbed in Source. In life, we all experience reality is going up and going down, especially when we are sad, or our realities are hard, our mind goes inward. Added to this is our breath five times a day flips to the right, and every time it flips to the right, we are inspired, but every time it’s not flipped to the right, our mind goes down. In other words, there’s a natural cycle that goes on up and down, up and down. It’s okay to be depressed. It’s okay to be sad. It’s okay to have a mind that feels not good. We must know this mind as Siddharta, the seeker. We know that we are sad and depressed for the reason of a reality, for the reason of our mind, and also there is a natural cycle going on. When we feel our mind going inwards or sad, take it all the way inward, hold the breath. Now, when we hold our breath, where are we going? Here’s when the mantra comes to play. Here is where we would utilize the mantra to go within to source. When we hold our breath, our Samadhi like state now, our retention of breath now is like a womb, when we are taking ourselves to source. So, let’s take a mantra, a Guru mantra for now, and feel the energies and let’s take ourselves into the innermost womb within ourselves. This is a very simple mantra. Consider: Siva. Si is infinite, Va is the goddess. Siva is the experience, Siva is infinity. Siva as Guru, who comes to us in the human form. Chant: Va Va Va Va Siva Guru Natha. Natha is being of light. So, when are reciting: Va Va Va Va Siva Guru Natha, the mantra, invoke all the beings of light! Christ, all Masters, all the Light Beings, any Being who has opened the door of consciousness for us, who has opened the doors to the spiritual realm for us. Invoke all the Gurus of past and present to us. Chant three times or more the mantra: Va Va Va Va Siva Guru Natha. This mantra is where we enter into Samadhi- by retaining breath holding on to the mantra. From this inner journey we connect to the womb of infinity. Take a deep inhale, hold the breath, feel the mantra within and go within. Exhale. When we go deeper and deeper into breath, we are beginning to come to point zero, the states of harmony, the states of primal core peace within ourselves. Know breath as the perfect instrument to be able to transform the mind in the moment. Navel Chakra Meditation: Now, take a deep inhale from the roots, every breath of ours inhale from the roots, hold the breath, lift the energy up above the navel, because it is up above the navel, where we access the Guru chakra that by default opens the third eye. Putting our hands, our fingers above the navel, take a deep inhale from the roots, lift the breath above the navel, and feel the third eye open and through the third eye, say the mantra three times: Va Va Va Va Siva Guru Natha. Rub our palms and receive the grace blessings of all the Gurus present in our invocation, of the beings of light to guide our thoughts. Pranayama- Breath Work: When we wake up from sleep, when we are wanting to bring focus, we are dealing with a mind that has gone through several layers of reality and we want to bring it into its core harmony. The left breath is the moon energy, the sun is the right breath. Pranayama is the tool to wake up the mind. By doing pranayama, we are awakening the mind to its greater potential. Now, there are so many forms of pranayama. This form of pranayama that we are going to do now is something you can do while driving a car, or while sitting down working on a computer, or simply walking or standing. This pranayama could be done at all times. When we do this, we are stimulating our mind to activate itself and access the different Siddhis, the different powers within our mind and that is, when the mind has been able to come to core harmony. Patanjali mentions, that you bring your mind to one single thought and hold it steadfastly, hold that one singular thought with focus. The mind becomes pristine and slowly the mind expands itself and awakens itself to receive its special powers to be this special power. Pranayama clears the mind to its pristine states. Press the left big toe down and take a deep inhale from the left. Just by pressing your left toe down, mentally visualize the breath to be from the left. Take a deep inhale from the left, and exhale from the left. Press the right big toe down, take a deep inhale from the right, and exhale to the right. Okay, do it a couple of times, inhale from the right by pressing the right big toe down, exhale to the right by pressing the right toe down. Inhale from the left by pressing the left toe down, exhale to the left by pressing the left toe down. Okay, now shift. Press the left toe down take a deep inhale, press the right toe down and exhale to the right. Inhale from the roots from the right, press the left toe down and exhale to the left, and imagining ourselves exhaling from the crown chakra. Press the left toe down, inhale from the roots, press the right toe down, and exhale through the crown chakra through the right. Inhale all the way from roots from the right, by pressing the right toe down, press the left toe down and exhale to the left. Take a deep inhale, hold the breath, lift the energy up above the navel, bring it to the third eye and say the mantra three times: Va Va Va Va Siva Guru Natha. Rub our palms together, receive the great blessings. What we did as this form of pranayama is powerful from the perspective of being able to reset our mind to its core zero, the core harmony, from where our thoughts now emerges from a mind, that is pristine in clarity. Dance: The reason I went up the mountain wanting to be with Guru Ayya was, I wanted to know, how was a Sage or Being, able to sit in one single place not moving, not for a day or two, but for months, for years to sit not moving. I was wondering what was that special going on inside. If it was so exciting to not even want food, so exciting to not want to have anyone to talk to, so exciting to go inside and go within, and be so totally absorbed. What was going on inside? And the revelation for me was, – there was a dance. There was a powerful dance! And then to realize that Nataraja, the Lord of the Dance, the Cosmic Lord of the Dance represents infinity, the core of infinity is within each one of us, and that core of infinity is the dance. If we know this dance, we are the inspired. If we know this dance, we are that vibrancy, the Spanda, that dance within, the passionate union of infinity and the finite, the passionate union of all states of joy, and that passionate states of joy blesses us with stillness. So, this state of joy is within the mantra. Going into the mantra and be aware of the state of dance within. Clap and chant the mantra a few times: Va Va Va Va Siva Guru Natha. Divine Beings, when we do our Yoga, end your Yoga with a dance. When sitting down, know there is a dance going on inside ourselves, our breath moving in and whirling upwards, there is a sacred dance within. Whatever we do, we are the dancer dancing! There’s a bliss emanating now. When we are the dancer vibrating frequencies of light, we know, we are now accessing our own beautiful mind that is blossoming. Know the dance, the dance within, at all times as the higher vibrations we are, generating wisdom as each thought. Incarnation Game: My Guru, Siddha Guru Rajaswamy would mention: “Invoke all the beings of light and they will serve you, and they will serve you by giving you the right thought, they will serve you by giving you the highest wisdom, they will serve you by paving your way to complete the highest purpose and your reason for birth!” Invoking all the masters, let the masters presence be with you. I would take it from an even further practical dimension: Think of Leonardo Da Vinci, think of Albert Einstein, think of Rumi, think of Mahatma Gandhi, think of all the beings, the masters who lived before us and think of all these beings as ever-present in us, if we can just say: “I am your reincarnation.” So simply invoke all the masters, and all the beings who are with us and proclaim especially with the masters who are not in the body. “I am your reincarnation, Abraham Lincoln.” All the beings who have been here, are moving humanity through frontiers. So, through the mantra, let’s invoke all the Gurus, chant three times: Va Va Va Va Siva Guru Natha. Rub your palms together and receive the blessing of all the masters. Let all the masters guide us. Let all the masters give us a thought, the right thought. Yoga Nidra- Yoga of Sleep & Waking Up Process: The next is, the time when we are most vulnerable is when we go to sleep. The time, when the mind resets itself is, when we go to sleep. The time, when we are resting ourselves from the process of thoughts is, when we go to sleep. Sleep is the time of incubating the mind. So how do we incubate the mind? Go into the mantra before you sleep. Before we sleep, meditate. As we meditate, imagine ourself being the pillar of light. Meditating as the pillar of light means, simply dissolving into that nothingness from, where the state of joy is, and this state of joy is light. Go into the state of light. Ideal mantra is Aum Namah Sivaya as the resonance has the energies to clear away anxieties and fear ( or chant any mantra that we might feel closer to). When chant the mantra, we are beyond destiny; we are beyond the sun; we are beyond the planetary system. We are that infinite, infinite, infinity that sees the vaster, grander sun of the universes. This is Lord Siva- Infinity. Realize our vastness chanting the mantra Aum Namah Sivaya. In yogic sleep In sleep we do not dream. Our sleep state is deep, when we have gone beyond dream with no REM (rapid eye motion). In our death like sleep there’s nothing other than the experience perhaps of being the Spirit. We plunge into that eternity of sleep, but a few hours of sleep suffices. We wake up in the morning, wake up in blessings of gratitude. The moment we wake up, think of our Mother as represented by our left hand, think of our Father, our with our right hand- rub both our palms together, and welcome ourself into the human reality thankful on cellular level to our Mother & Father. Do the same exercise thinking of our Cosmic Mother & Cosmic Father. Praying for the right thoughts as our first prayer upon waking up gifts us the right mind of consciousness and its wisdom that creates enriching realities. Puja- Source Unions: The 9th dimension is doing the puja. A puja is the mother of meditation- as the mind is taken to effortless meditative states after a puja. A puja means worship. A puja works bringing the power of infinity into the finite. That is, a puja from the perspective of having an idol, having the lingam and bringing our focus, we are enhancing a powerful state of the mind, which is the Yogic focus. If we do the puja with a Siva lingam or with the deity, and say the mantras with focus, that invoked infinity energy resonates within our finite realities. When we are able to bring our mind together into a single pointedness, it’s like a magnifying glass converging light into fire. That is the power of a puja. The puja multiplies the minds empowerment by allowing us to get into the states of Yogic focus, because it is inside the Yogic focus where the dance is happening and this inside the dance, we are the dancer. Step into being the dance through the puja. Then understanding that everything we do is the worship. Every moment of ours is the worship. Every dimension of ours is the worship, where we are connecting to the divine in all layers, the supreme Tantra. This supreme Tantra on all layers means, we are connecting the infinity into the finite, in all layers of our experiences, this is the puja. Turiya States of Super-Consciousness: The final dimension of the attainment of the Turiya states, is understanding, what the Turiya states is all about. In temples in India, especially goddesses, she had many heads. In Lord Vishnu showing himself, as the Supreme God creator to Arjuna, has all the heads, many heads. In the Ramayana, Ravana was portrayed with ten heads, he was a worshipper of Lord Siva. Those heads, the multiple heads, represents the states of Turiya, the Super Mind state of the Yogi. In this state of the Super Mind is, we know – so we are inspired. If we know, and if we are the dance, and we are inspired, we’ve gone beyond sleep, we’ve gone beyond hunger, we’ve gone beyond the limits of the body in the form of heat and cold and hunger, we’ve gone beyond the limits of the mind in the form of sleep and fatigue. We’ve gone into the state of the spirit dancing, this state of Turiya is the yogic mind. Now in the state of mind, not only we do have access to the highest of wisdom of all the masters, but also our mind is able to align that grace into realities, align that grace into the genius of our hearts’ doings. With all the grace of the Gurus, with the grace of the moment, may each of our lives be transformed. – Outer Guru who awakens the Inner Guru- 5 Gurus. The first of the dimension is, understanding the Guru as Consciousness, and as five states of Consciousness: breath, our father, mother, the outer Guru, the inner Guru and everything is the Guru. – Time & timelessness, the 24 hrs cycle. Next, knowing the time cycle, and in the time cycle, within the 24 hours, light a lamp once a day. Observe the new moon to celebrate the spirit Lord SIVA, observe the full moon to celebrate the awake mind Lord Vishnu. Know these time cycles, set yourselves free by connecting to source. Connecting to source, means connecting to timelessness. Connect to timelessness, define time. – Know breath and the womb of Samadhi & the Navel Chakra. Know breath from the states of Samadhi and know Samadhi as a womb from where we grow our mind. – Pranayama: Alternative breaths in yoga, meditation and every experience. From here, understand, and know the navel chakra and the awakening of the third eye with the activation of the navel. – Be the Dance. Meditate. Attain Yogic vibrancy. Know the dance, the dance within, be the dance at all times, so our life is meditation. So, our thought is from a meditative mind, in other words, a pristine mind and a thought from a pristine mind is pure wisdom. – Invoke all Masters. Reincarnation. Invoke the masters, invoke all the masters, let all the masters shower us with the right thoughts. Shower us with alignment to our highest purpose and allow us to blossom from the perspective of each master completing their life work through us. – Sleep in womb of Light & wake up to align the mind. Sleep in the womb of light. When you sleep in the womb of light, that is going into the mantra light and then entering into sleep, this mind is nourished, so when we wake up, we are waking up with a mind that is ready, a mind that is high vibrancy state, able to connect to source even more deeply and rework realities, and work realities in alignment to source grace. – Puja: Create concentration & yogic focus. The puja is the worship of divinity, the worship of source through time, through what we do, seeing every reality as connected to source. Seeing perfection in all of everything, and yet understanding through this perfection. There we are, connecting to source on all the layers and allowing the source unions as passion to work its way. So our life is a blossom, so every reality of ours a blossom, so every chakra of ours is in blossom, enjoying the grace of light. – Turiya- yogic states of super consciousness. Awaken and allow yourself to be the vastness, to be the grandness, to be the giant in what we do. When we know we are the giant being, a huge big soul in the body, when we know we are the vast beingness, we are able to shine our genius in all the facets, where we bring our focus. With this, may Consciousness as grace be for each of us. May our inner Guru shine and uplift humanity while completing our life purpose. Nandhiji www.nandhiji.com is a Siddha yogi, humanitarian and visionary awakening humanity through mystic wisdom, community and service. He is an artist, ecstatic chant musician, author and teacher, representing the path of the Liberated. He lives in Los Angeles, where he shares the life-enhancing wisdom and teachings of the Siddhar sages, the liberated mystics of South India. Nandhiji was gifted with a childhood experience of the Divine when he was four years old. Later as a young adult, while leading an active family life, he was initiated through a death experience by his first Guru, and his journey into the mystical realm of the Siddhas as a yogi began. 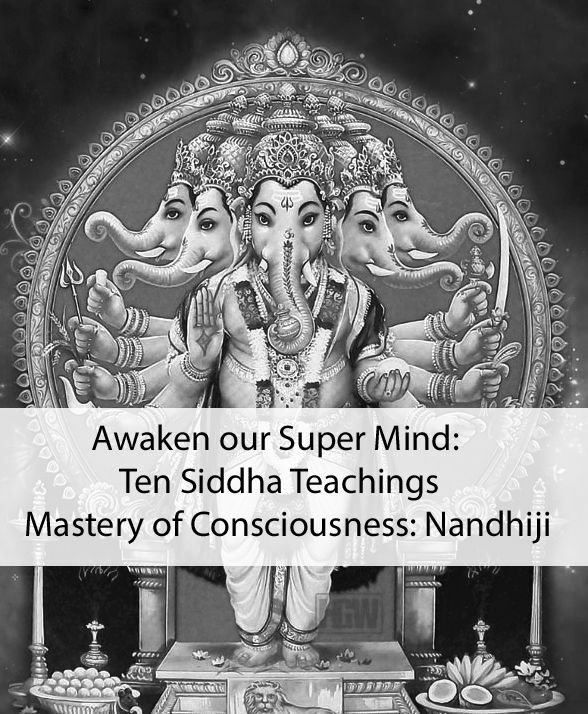 After years of seeking ‘wholeness’ through connection with the inner world, Nandhiji woke up to understand his highest purpose: to uplift humanity in consciousness. One of the fruits of his journey are offered in Mastery of Consciousness. Nandhiji says, “When we awaken the inner lamp, we liberate ourselves to the grace of our own wisdom, our Inner Guru, Consciousness!” Nandhiji envisions a humanity awake through yogic wisdom, enterprise and community.